Sign, sign, everywhere a sign. Hope you saw this one. The Ironman 70.3 California Oceanside is being run on Saturday, March 28, 2015. The course includes our Trestles Bike Trail. 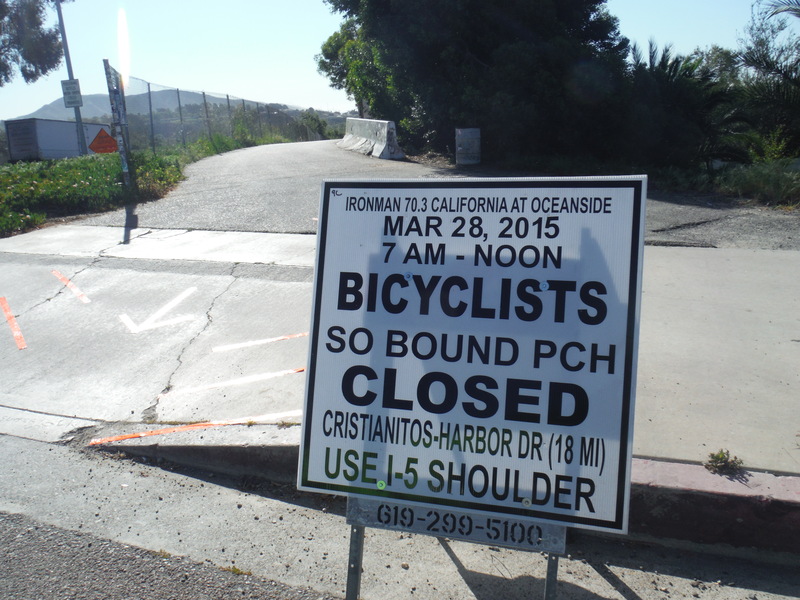 The Ironman cyclists will be riding south to north and will turn east at Cristianitos. It doesn’t seem imaginable that they would close down all access to Trestles for this 7:00 am to noon event. Click on the .pdf map below. Indeed they must at least allow access down the dirt path on the east side of the freeway and across the bike path where they cross at the bottom of the hill. We’ll see. There could be an insurrection if they block all access with a south swell expected to peak on Saturday. But, then again, for those with the fortitude to get there some other way, it could be the most uncrowded day of the season. We’ll see. Let’s put on our most cooperative demeanors. Remember we may need their help the next time the Tollroad comes up.